Is it impossible to satisfactorily stage Wagner’s gargantuan Gesamtkunstwerk in a semi-staged performance? Anyone following coverage of this season’s BBC Proms at the Royal Albert Hall will be aware of the huge success of Barenboim’s complete performance of Wagner’s Der Ring des Nibelungen for the first time in the festival’s history. Reviews have been glowing, and the applause at the end of the last opera in the cycle – Götterdämmerung – lasted at least thirty minutes. However, there are distinct problems with the idea of performing Wagner’s operas as a semi-staged production in which the orchestra takes up by far the largest portion of the stage. The full cycle of four operas was first staged in 1876 at Wagner’s specially designed theatre in Bayreuth. This theatre had a hidden orchestra pit, so that the audience may be able to focus on the singers acting out his great drama. The importance of the actor/singer as a “moving and speaking dramatic presence” (Lesley Stern), who embodies the Gesamtkunstwerk of music, text, and staging through singing and action can be seen in Wagner’s own detailed stage directions in the scores. So, notwithstanding reviews such as Tom Service’s “Why the Proms Ring Cycle is realising Wagner’s True Intent”, could the Ring cycle at the Proms ever be completely successful? As mentioned above, Wagner wrote detailed stage directions and descriptions of scenes and sets into the score, provided in the Libretto for the Proms audience and producing mixed results during the performance. The complete lack of any set was partly mitigated by subtle and effective use of lighting and changes to the projection at the back of the stage; particularly effectively employed were leaping flames as Wotan exhorts Loge to surround Brünnhilde’s fell with a ring of fire, and at Brünnhilde’s immolation scene. However, this still fell short of Wagner’s instructions for rugged cliffs, horses, trees, and even the arrival of Siegfried on a boat on the Rhine in Götterdämmerung. In helping to conjure up the world of the Ring cycle having the set descriptions was vital, but in terms of the stage directions and acting, it could prove a distraction. It was frequently disconcerting to read that the actors on the stage were supposed to be performing one action, whilst watching them perform quite another or (as was predominantly the case) not do anything at all. It lead one to feel that two operas were occurring simultaneously: the one encapsulated in the libretto, and the one being performed upon the stage. Other aspects of the semi-staged nature of this production also generated uncertainty as to exactly what was taking place. The singers not being in costume led more to a sense of a concert performance, and the total lack of props was perhaps a misjudgement when Wotan’s staff and the sword ‘Nothung’ are such vital parts of the plot and action. The singers themselves also engaged with the possibilities for dramatic action in very different ways. That is not to say that the singing itself was not dramatic, as it was in nearly all cases, but the way in which the singers used the stage varied from opera to opera. Indeed, the performances became more ‘dramatic’ with each opera, arguably culminating in Andreas Schager’s hugely charismatic and physical performance of Siegfried in Götterdämmerung. 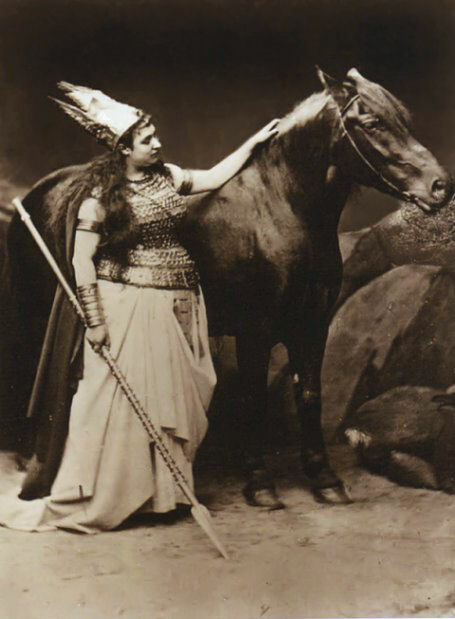 Schager’s performance seemed to spur on the other fine performers in the final opera, causing it to be arguably the most ‘staged’ of the cycle. There are, of course, exceptions to this rule. Peter Bronder played Mime at once comic and grotesque, and the chemistry between Nina Stemme (Brünnhilde) and Bryn Terfel (Wotan) produced an intensely passionate Die Walküre. It has been a theme in reviews of this cycle that performances focus on gravitas rather than dramatic flair – most likely a result of the constraints of the staging. In one memorable scene, the staging was used to its full potential. In Siegfried, Lance Ryan climbed through the orchestra to reach the cor anglais player producing the distorted sound of Siegfried’s reed pipe. Not only that, by Ryan did his best to distract the solo horn player brilliantly playing Siegfried’s horn call, even going as far to quip “Got any others?” in English. This brief reference to the fact that the huge orchestra was dominating the stage showed a possibility for more imaginative and clever direction in the semi-staged cycle but also made it clear that, in many ways, full dramatic potential was not delivered. This forms the first part of Helena’s review of the Proms Ring cycle; the second part will be published next week. For more information about upcoming BBC Proms, please visit their website.